We’d love your help. Let us know what’s wrong with this preview of Saga Land by Richard Fidler. A new friendship. An unforgettable journey. A beautiful and bloody history. Broadcaster Richard Fidler and author Kári Gíslason are good friends. They share a deep attachment to the sagas of Iceland - the true stories of the first Viking families who settled on that remote island in the Middle Ages.These are tales of blood feuds, of dangerous women, and people who are compelled to kill the ones they love the most. The sagas are among the greatest stories ever written, but the identity of their authors is largely unknown. To ask other readers questions about Saga Land, please sign up. My God this was beautiful. I decided to go with the audiobook because of Richard Fidler (Mr Radio, why wouldn't you?) and was delighted to discover that Kári Gíslason co-reads it and that his voice is just as beautiful to listen to as Richard's. They both completely swept me up into the world of Iceland, past and present, so thoroughly that at times I felt like I was there with them. Saga Land is a hard book to describe - it's part memoir, part travelogue, part buddy story, part Icelandic saga (w My God this was beautiful. I decided to go with the audiobook because of Richard Fidler (Mr Radio, why wouldn't you?) and was delighted to discover that Kári Gíslason co-reads it and that his voice is just as beautiful to listen to as Richard's. They both completely swept me up into the world of Iceland, past and present, so thoroughly that at times I felt like I was there with them. 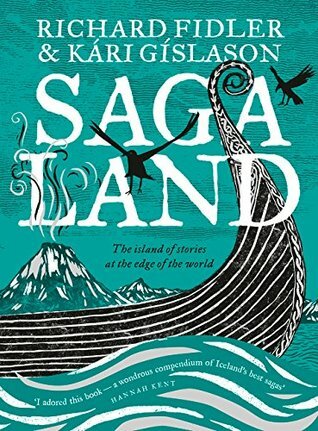 Saga Land is a hard book to describe - it's part memoir, part travelogue, part buddy story, part Icelandic saga (which are very fable-like) and part history. While I loved the big sagas of Iceland and the sweeping descriptions of the country itself, it was Kári's own more intimate story that really drew me in. I felt like a friend was telling me his life story, over a coffee, a good meal or a glass of wine. I can see how Kári Gíslason is a popular and respected teacher. Before I start this review let me say, if you get the opportunity to see the authors speak about Saga Land - do it. Saga Land is part compendium of the Icelandic sagas, part personal journey and memoir for Gislason. I have to say I loved every minute of this book. I enjoyed learning about Iceland's history, both in early and recent times. The sagas are fascinating, bloody and filled with honour. Snorri's history was rich and epic, Gudrun's saga was haunting and memorable. I could get lost in the Before I start this review let me say, if you get the opportunity to see the authors speak about Saga Land - do it. Saga Land is part compendium of the Icelandic sagas, part personal journey and memoir for Gislason. I have to say I loved every minute of this book. I enjoyed learning about Iceland's history, both in early and recent times. The sagas are fascinating, bloody and filled with honour. Snorri's history was rich and epic, Gudrun's saga was haunting and memorable. I could get lost in these stories forever. Kari's journey and personal reflections were another highlight. I found myself tearing up when he gets his moment of truth, a moment that the reader slowly builds towards throughout the book. I was surprised at how emotionally invested I found myself in this journey. Richard has a beautiful simplicity in his words - I was hooked on every chapter. The switches between Richard and Kari's chapters are seamless and I found myself enjoying their two intertwined and complimentary paths. Visually it is a stunning book, a large hard-cover that has gorgeous plates at the beginning and end taken by the boyd on their trip to Iceland and with more images scattered throughout. 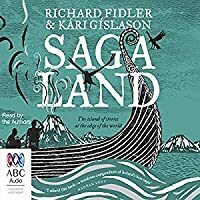 Richard Fidler and Kari Gislison meet on Richard's radio show when Kari talks about his passion for the Icelandic Sagas. They join forces to visit Iceland and make a radio documentary and write a book about their visit. They plan to open up the Sagas and visit the places in Iceland where they occurred. At the same time, Kari is returning to his birth place and attempting to come to terms with his family story. Sounds dry as dust but it was anything but. I loved every minute of it. I am a great fa Richard Fidler and Kari Gislison meet on Richard's radio show when Kari talks about his passion for the Icelandic Sagas. They join forces to visit Iceland and make a radio documentary and write a book about their visit. They plan to open up the Sagas and visit the places in Iceland where they occurred. At the same time, Kari is returning to his birth place and attempting to come to terms with his family story. Sounds dry as dust but it was anything but. I loved every minute of it. I am a great fan of Richard Fidler's so was always going to read this book. Also my daughter lived in Iceland for 12 months as a teenager on student exchange so I knew quite a bit about Iceland and even some of the saga stories. I also knew some of the history of the time such as the life of Harald Finehair, King of Norway. But even without all that, I would have delighted in this book. The presentation of the sagas is wonderful, particularly the continuing connection to the landscape and therefore the continuing lives of Icelandic people today. That is just fascinating and amazing and a story beautifully told. And that creates context for Kari's family story which is moving, honest and thoughtful. The sagas, Icelandic history and Kari's story are all about the intrinsic importance of family to Iceland. There was no heaviness and neither of the authors took the opportunity to preach or display any pomposity. Both are wonderful raconteurs and the stories head off into various nooks and crannies of interest. This book, part-travelogue, part-family history, part story-telling is a wonderful tribute to Iceland and its Viking history. There are different types of sagas as well: family sagas, including co-author Kári Gíslason’s own family saga and the saga of Snorri Sturluson. Richard Fidler and Kári Gíslason met when Fidler interviewed Gíslason about his unusual family history. Kári Gíslason was born in Reykjavik to Susan, an Australian, and her Icelandic lover Gísli. Gísli was a married father of five, who begged her to keep his identity secret. Gíslason returned to Iceland as a young adult and contacted his half siblings. There was a family get-together, during which Gísli told Gíslason that he was descended from Snorri Sturluson, Iceland’s most famous writer of sagas. The sagas are the stories, a history, of the Vikings who settled in Iceland during the Middle Ages. They are bloodthirsty tales of honour and revenge, of great significance to the Icelandic people. The sagas are read at school and their meaning is still debated. ‘Saga Land’ is a record of two trips made by the authors (one in summer, the other in winter). The trip had two purposes: to make a radio documentary retelling some of the sagas where they happened, and to try to discover whether Gíslason really is descended from Sturluson. The book is divided into four parts, with both authors taking turns to tell the story. For Gíslason, it is a homecoming, an opportunity to find out more about his family history. For Fidler, it’s an adventure, an opportunity to experience and learn. I enjoyed this book immensely. It’s a wonderful blend of travelogue and story-telling, and a great insight into the history and literature of Iceland. It’s also a very personal story about identity. Richard Fidler writes like he talks. Educated, erudite, often of awe of his topic. This time he heads off to Iceland with his chum Kari Gislason (author of two previous memoirs The Promise of Iceland and The Ash Burner) in search of the Icelandic Sagas and to conclude Kari's own search for his roots to Snorri Sturluson. I have found reading the sagas a challenge. Too many begettings, beheadings, bewitchings and back stabbings with multi characters. But Richard and Kari go to the places where the Richard Fidler writes like he talks. Educated, erudite, often of awe of his topic. This time he heads off to Iceland with his chum Kari Gislason (author of two previous memoirs The Promise of Iceland and The Ash Burner) in search of the Icelandic Sagas and to conclude Kari's own search for his roots to Snorri Sturluson. I have found reading the sagas a challenge. Too many begettings, beheadings, bewitchings and back stabbings with multi characters. But Richard and Kari go to the places where the events of some of the sagas happened. They also have rewritten the featured sagas in simple clear language. And they intersperse these with personnel stories and odd stories in Icelands' near and far history. Teaching year 8 History - which has a Vikings topic - meant this felt a bit like work for me... but in a good way! I'm fascinated by Iceland, I love a bit of travel writing which this kind of is at times, and although I'm interested in the sagas I think this was a better way for me to read them than to just look at them in their own. This is a great read for its mix of subject- it is not just a collection of Norse mythology or deep history. It is the personal story of a co author establishing their right to be acknowledged as part of the unbroken lineage of Icelanders. It is the mythology and the history and the current culture. It captures the story of chess player Bobby. It is not a dry read, the language just flows, a 1000 year story. There is even a chapter near the end that explains why we still have these sagas preserve This is a great read for its mix of subject- it is not just a collection of Norse mythology or deep history. It is the personal story of a co author establishing their right to be acknowledged as part of the unbroken lineage of Icelanders. It is the mythology and the history and the current culture. It captures the story of chess player Bobby. It is not a dry read, the language just flows, a 1000 year story. There is even a chapter near the end that explains why we still have these sagas preserved at all and it might surprise you. Imagine books- or more likely animal skins - stored in barns and used to strain ... what I don’t know...food in a kitchen. Or cut for shoe soles, and a man spends 13 years to collect the fragments and there you have the great story of it coming together. But no, then you have a fire in Copenhagen where they were stored. And we have what was rescued in a cart. It was a powerful point for me - how long something when hidden is safe but where it is exhumed for preservation the precious object is exposed to ruin by being loved too much or the sharp end of nature. How do we choose? This is one of the most compelling books that I've read in a while. The strands - of ancient saga, of Kari and Richard travelling through present day Iceland, and of Kari's journey to unearth his ancestry - are beautifully woven together. Must read. I am so glad I have read Saga Land. When I had originally been introduced to this book at a publishers roadshow event, I knew this would be a great seller. It had a previous release behind it in Ghost Empire by Fidler and his son, it has the ABC Radio publicity channels promoting it and it is getting great advertising in general by the publishers. It is also probably helped along by the fact that shows like the History Channel's Vikings are very in vogue at the moment. The Grey haired crowd woul I am so glad I have read Saga Land. When I had originally been introduced to this book at a publishers roadshow event, I knew this would be a great seller. It had a previous release behind it in Ghost Empire by Fidler and his son, it has the ABC Radio publicity channels promoting it and it is getting great advertising in general by the publishers. It is also probably helped along by the fact that shows like the History Channel's Vikings are very in vogue at the moment. The Grey haired crowd would love it. What I didn't expect was that I would love it. Viking history drew me to it, Iceland as a setting drew me to it, history drew me to it, an Australian tie in drew me to it, the delightful square-ish hardback gift format drew me to it. Turns out, that from right under my own nose, I was probably going to love this book the whole time. I learnt vast amounts of new things from this book. But it felt like I was being told a story, a saga if you will, rather than having immeasurable quantities of information shoved in my brain. Iceland and Icelandic history, culture, language, honour codes, superstitions and people are wholly fascinating. As a very small country that is somewhat isolated from the rest of the world, there isn't a lot of places that you can get first hand information from. Co-writing with Kari Gislason brought that aspect into the book. It made it more personal and gave Iceland a face. Whilst I felt that there was some padding done in places, the chapter on US chess grandmaster Bobby Fischer for example, and the chapter on US President Regan and the star wars program; they added the whole "Iceland's place on the modern world stage" element that was probably otherwise lacking. Maybe these chapters could have been a little shorter and it would have felt less like these were tangents where Fidler got carried away researching. Saga Land was otherwise very well put together. You need not be so sad, sad. The young woman who had let her child die of exposure thought that she recognized its voice. She took such a fright that she lost her mind and remained insane the rest of her life. Sleep now you black-eyed pig, fall in a deep pit of ghosts. I thoroughly recommend the Bolinda audio recording by Richard Fidler and Kari Gislason, despite some weird pauses in the recording, it is well done. Gislason and his Icelandic language skills lend a great transportational quality to the reading. I loved Richard Fidler’s earlier book, Ghost Empire, about his journey to Constantinople with his son, which entwined travel writing with history and legend in a very personable and beguiling way. And I’ve been interested in Iceland and its astonishing sagas for quite some time. So, I was keen to read Saga Land from the second I heard about it. Subtitled ‘The Island Of Stories at the Edge of the World’, Saga Land is the story of how ABC broadcaster Richard Fidler became friends with one of his gu I loved Richard Fidler’s earlier book, Ghost Empire, about his journey to Constantinople with his son, which entwined travel writing with history and legend in a very personable and beguiling way. And I’ve been interested in Iceland and its astonishing sagas for quite some time. So, I was keen to read Saga Land from the second I heard about it. Subtitled ‘The Island Of Stories at the Edge of the World’, Saga Land is the story of how ABC broadcaster Richard Fidler became friends with one of his guests, the author and academic Kári Gíslason. After his interview on Richard’s show ‘Conversations’, the two stood chatting by the lift for more than an hour. They shared a deep interest in the sagas of Iceland – ‘true tales … of blood feuds … dangerous women, and people who are compelled to kill the ones they love the most,’ as the blurb describes these ancient and eerie stories. Eventually Richard and Kári travelled together to Iceland, to explore the landscape and history and folklore of this bare fierce country. Kári was born in Iceland, but did not know his father or his father’s other family until he was an adult. So, for him, the journey is a homecoming and a chance to explore his ancestral roots. For Richard, it’s an adventure and a discovery. Like Ghost Empire, the book weaves together memoir, travelogue, history and mythology, which is one of my favourite types of books to read. The memoir and travelogue sections of the book feel real and warm and intimate. The recountings of the ancient sagas are fresh and clear and simple, bringing them back to powerful and immediate life. And the history of Iceland is bloody and fascinating. I also really loved the photographs included in the book. Usually I read non-fiction in small bites, squeezed in between my reading of novels. I read Saga Land in one big gulp. It was utterly mesmerising. If you're going to pick up this book, I *highly* recommend the audiobook. Richard Fidler is a radio personality in Australia so he has a lovely reading voice. Kári Gíslason is a university lecturer who also has a lovely voice, and his lilting Icelandic pronunciation is beautiful. He does occasionally pause in odd places but it's more a charming idiosyncrasy than an annoying flaw. Saga Land is very difficult to categorise - part memoir, part travelogue, part buddy road trip, part saga retelling - If you're going to pick up this book, I *highly* recommend the audiobook. Richard Fidler is a radio personality in Australia so he has a lovely reading voice. Kári Gíslason is a university lecturer who also has a lovely voice, and his lilting Icelandic pronunciation is beautiful. He does occasionally pause in odd places but it's more a charming idiosyncrasy than an annoying flaw. Saga Land is very difficult to categorise - part memoir, part travelogue, part buddy road trip, part saga retelling - and yet the disparate pieces all come together in one coherent whole. It made me immediately start planning a trip to Iceland in a few years with some friends. The attachment of the authors to the country is obvious, but they don't sugar coat its problems either. The resolution of the central plot thread of Kári's ancestry made me cry on the train. It was beautiful and moving, and hearing Kári tell it in his own voice was very special. A beautifully woven tale of medieval Icelandic Sagas and a modern journey by the authors to disentangle their own ties to the country's history. The chapters alternate between the two authors seamlessly, as does the narrative between the modern and medieval accounts. Filled with stunning and bleak landscapes, warm-hearted but cold-faced people and enough gods, axe fights and wars to satisfy even the most bloodthirsty of readers, Saga Land is a voyage well worth embarking on. Loved this book - funny, moving, beautiful, fascinating. I slowed down over the last few chapters, rationing my reading time because I didn't want to finish it. And now, I REALLY want to visit Iceland. More cohesive thoughts to come. I love the way the authors, Richard and Kári draw from the historical Family Sagas of Iceland and from Kari's own modern day family saga, giving greater significance to resolving Kari's own family mystery. Richard Fidler has a way with words that is crisp and brilliant,as does his friend and co-author Kári Gíslason. I'll be looking out for more of both of their works. A beautiful mix of travelogue, memoir and of course, the Icelandic Sagas. This book tells the tale of an Australian and an Icelandic-Australian who journey to the country - to record the sagas for an Australian radio audience and chase down some familial history. It's left me longing to return once more to that magical and mystical place - the land of ice and fire. While this book was interesting, particularly for someone like me who knows little about Icelandic history and culture, I found the saga interludes confusing and the overall structure of the book confusing and a little... aimless. The book jumps between two people’s 2 week trip through Iceland, also jumping back through different times in their earlier lives, all interspersed with sagas, and nothing to link them all together... perhaps I just didn’t get it. 4 1/2 stars. Probably helped along by seeing the authors live at Adelaide Writers Week, but really enjoyed the mix of getting to learn (I love history) but having an interesting contemporary story to follow as well. I read this book as slowly as I could, wanting to stay within the pages of so many sagas. A beautiful journey. This exquisite book has been on my shelf since this time last year. For most of the interim it has been enough to caress its glittering cover and pore over the haunting colour plates. I will admit (now) to being slightly daunted by the lengthy list of saga characters that opens the book and (on two occasions) to allowing Richard Fidler's dry introduction to dent my resolve to tackle it. Do not be put off, as I was. Once Kári's 20th century Icelandic saga begins, which I can still hear intoned in This exquisite book has been on my shelf since this time last year. For most of the interim it has been enough to caress its glittering cover and pore over the haunting colour plates. I will admit (now) to being slightly daunted by the lengthy list of saga characters that opens the book and (on two occasions) to allowing Richard Fidler's dry introduction to dent my resolve to tackle it. Do not be put off, as I was. Once Kári's 20th century Icelandic saga begins, which I can still hear intoned in his own resonant, mellifluous voice, this becomes a thoroughly absorbing read, moving me to tears in parts. The medieval sagas are brutal and bloody but masterfully wrapped in Kári and Richard's learned commentary and often amusing travel journal episodes, which grants them context and relevance. I particularly loved the ghost stories and the histories which explain why a belief in the little folk and spirits is still so prevalent. You will (if you haven't already) realise the greatest respect and reverance for the land of Burial Rites (Hannah Kent) and Jólabókaflóðið, where even hundreds of years ago literacy was almost universal, writing and language are essential elements of history and culture, and the percentage of the population who have written or published a book is unmatched anywhere in the world. I highly recommend this book, when you can enjoy a relaxing week or two to immerse yourself and devote the attention it deserves, particularly if (like me) you yearn to travel or return to the stark island outpost that is Iceland. This book is all the preparation you need to gain the utmost from such an unforgettable adventure. I went to an event for Saga Land before I read the book where the authors told some of the Icelandic sagas, like they were traditionally meant to be told. I was completely entranced and had to find out more. This book covers more than just the sagas, though. Kari Gislason's first book, The Promise of Iceland, is also touched on a little - explaining Kari's attachment to Iceland and his disconnected past with his father. The journey that Richard and Kari go on to record the saga's in Iceland was I went to an event for Saga Land before I read the book where the authors told some of the Icelandic sagas, like they were traditionally meant to be told. I was completely entranced and had to find out more. This book covers more than just the sagas, though. Kari Gislason's first book, The Promise of Iceland, is also touched on a little - explaining Kari's attachment to Iceland and his disconnected past with his father. The journey that Richard and Kari go on to record the saga's in Iceland was captivating. I think at times I was more interested in their stories than the saga's themselves. I listened to the audiobook but also flicked through my physical copy at the same time. The physical copy has beautiful photography that you miss out on if you are listening to the audiobook. The audio version had the added bonus of being able to understand how all the different names were pronounced! I think my favourite sagas were The Saga of Gunnar and Hallgerd and The Saga of Gundrun. A very interesting book about Iceland – a land gaining a lot of attention in last years. The two friends, Kari and Richard are traveling together. For Kari, it is much more than a fleeting visit – he is, so to speak returning in search of his family roots. Is he truly a descendant to Snori Sturluson? The man who has collected the Norge Sagas and left us a written record of it? The man without whom we might have never heard of Odin and Thor? The chapters alternate between the two authors record A very interesting book about Iceland – a land gaining a lot of attention in last years. The chapters alternate between the two authors recording their own impressions of the land. There are some flashbacks of Kari’s childhood spent in Reykjavik, as well as later on working there as an English teacher. Inserted are also some Viking sagas and reports about people who came to occupy Iceland. The living conditions were harsh, and so were the people. Family feuds are solved by brutal fighting between the tribes. There is also information on history of Iceland, past and recent. I liked the report about the world chess championship between Bobby Fischer and Boris Spassky, and about the meeting of Gorbatchov with Reagan in a haunted house on the island. "Hook: the when, where and who of the story. How/event: trying to fix the problem. I suspect there is a whole slew of Australians currently booking flights to Reykjavik as a direct result of this book. A funny - but clearly for most people successful - mix of memoir, travelogue, history and retelling of Viking legends, it evokes a tough, austere, beautiful country and its people so vividly it is as if you could step out of your door and sit next to a fjord. Not all of it engrossed me. To my surprise, I found some of Fidler's patented self-deprecating Aussie-abroad stuff irrita I suspect there is a whole slew of Australians currently booking flights to Reykjavik as a direct result of this book. A funny - but clearly for most people successful - mix of memoir, travelogue, history and retelling of Viking legends, it evokes a tough, austere, beautiful country and its people so vividly it is as if you could step out of your door and sit next to a fjord. Not all of it engrossed me. To my surprise, I found some of Fidler's patented self-deprecating Aussie-abroad stuff irritating rather than charming, and his slightly more historic take on the sage retellings went into some digressions I wouldn't have followed. Kari Gislason's story however, was more than enough to carry a memorable book. In Gislason's retellings, his personal saga to reconcile his relationship with his birthland, his father, his heritage all merge in quite wonderful ways. Iceland comes across as longed for but slightly inaccessible, a country hard to live with or without, inspiring of both loyalty and betrayal - and where the difference between the two is impossible to tell. This is writing at its finest, the kind that feels a privilege to read as the author lets you see something very precious and personal. With Vikings. The story of Káre Gíslason’s search for identity segues with the Viking sagas of Iceland. Instead of the vicious and horrifying physical violence that underpins the Viking culture, Gíslason’s personal saga is psychological. The impact of his father’s denial of him as his son haunts him. Richard Fidler accompanies Gíslason to Iceland, and motivates him to take steps to ascertain his Icelandic identity. The Icelandic sagas are there, told in the context of the places the authors visited. I found th The story of Káre Gíslason’s search for identity segues with the Viking sagas of Iceland. Instead of the vicious and horrifying physical violence that underpins the Viking culture, Gíslason’s personal saga is psychological. The impact of his father’s denial of him as his son haunts him. Richard Fidler accompanies Gíslason to Iceland, and motivates him to take steps to ascertain his Icelandic identity. The Icelandic sagas are there, told in the context of the places the authors visited. I found the quantity of characters and their names confusing. I had to resort to keeping a list. Many of the names are similar, many starting with ‘Thor’ as in Thórd Sturluson, Thórdís Snorradóttir, Thorfinn, Thorgerd, Thorgrim, and so on and so forth. There is a list at the beginning of the book that is helpful. My main issue with this book are the black and white illustrations. Really, they could be omitted without disadvantaging the book in any way. Imagine, if you will, the blurred CCTV pictures of hooded criminals with the Police caption, “Have you seen this person?” Well, that is the quality of most of the black and white photos in the book. Pathetic. The colour plates are reasonable but I’m not sure what they pertain to – thereby irrelevant. Richard Fidler is one of ABC's (Australian Broadcasting Commission) most popular presenters, best known for his hour-long interview program, Conversations with Richard Fidler. The program is ABC Radio's most popular podcast, downloaded more than 1.5 million times per month. It features local and international guests from all walks of life, engaging in in-depth interviews. He first came to prominenc Richard Fidler is one of ABC's (Australian Broadcasting Commission) most popular presenters, best known for his hour-long interview program, Conversations with Richard Fidler. The program is ABC Radio's most popular podcast, downloaded more than 1.5 million times per month. It features local and international guests from all walks of life, engaging in in-depth interviews. He first came to prominence in the 1980s as a member of the Doug Anthony All Stars (DAAS), an Australian musical comedy group also comprising Tim Ferguson and Paul McDermott. The group disbanded in 1994. Richard began his broadcast career on TV, and presented shows including: Race Around the World; Aftershock; Mouthing Off, and Vulture. In 2011 Fidler was awarded a Churchill Fellowship to investigate new forms of public radio in the United States and the United Kingdom. He is the immediate past-President of Brisbane’s Institute of Modern Art (IMA) and a member of its board of directors. He is married to Khym Lam and has 2 children.